Meet the new Kia Sorento available at Kendall Kia! Redesigned and re-engineered, the Sorento is more spacious and more elegant than ever before. This midsize Kia SUV is perfect for families and anyone in Nampa needing extra room. Loaded with amenities and options, the Kia Sorento is available in Kia Sorento L, Sorento LX, Sorento LX V6, Sorento EX V6, Sorento SX, or Sorento SX Limited trim levels. Now that’s variety! Create the perfect new Kia SUV in Nampa for you today at Kendall. Begin by browsing our available inventory of the new Kia Sorento in Nampa. Come say hello in person and test drive the Kia Sorento at our Kendall showroom. Our Nampa Kia dealership is just a short drive from Boise, Meridian, and Caldwell at 15700 N Idaho Center Blvd Nampa, Idaho 83687. The new Kia Sorento–the midsize SUV you’ll want to see. After browsing our selection of the Kia Sorento, please call us or contact us online here at Kendall Kia if you have any questions. Our friendly sales team is ready to assist you through your car buying experience. We’ll take care of your current vehicle and give you a fair trade-in value. We’ll also help you find the perfect finance option that fits with your lifestyle and budget needs. At Kendall, we make purchasing a new Kia car an enjoyable process that you’ll remember with a smile. The Kia Sorento has a standard 2.4L DOHC I-4 engine and six-speed automatic transmission. Add more kick under the hood by opting for the 3.3L V6 engine or an eight-speed automatic transmission. Front-wheel drive (FWD) comes standard with the Kia Sorento, or you can upgrade to the DynamaxTM (AWD). The AWD system has a Torque Vectoring Cornering Control (TVCC) function perfect for slick roads in the snow and rain. Equipped with Kia Drive Wise, the Kia Sorento is built with safety smarts. Available Blind Spot Collision Warning (BCW) system manages blind spots to the side and rear of your SUV. Smart Cruise Control is designed to adapt to your environment by automatically applying the brakes or accelerator to maintain a predetermined distance from the vehicle in front of you. The Kia Sorento has plenty of safety features both standard and as optional add-ons. Some standard safety features include four-wheel ABS with all-season tires, an anti-theft alarm system, stability and traction control, tire pressure monitoring, rollover sensor, hill-start assist, and a comprehensive airbag system. 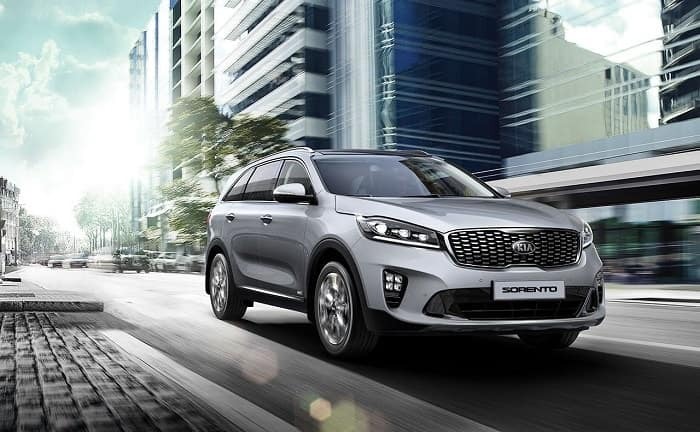 Other thoughtful features include rear defogger and wiper blade and keyless entry, perfect for keeping inclement weather at bay and you safe and warm inside the Sorento. It’s not all business with the Kia Sorento. Entertainment features include Bluetooth® wireless data link for hands-free calling, satellite radio, and USB port with external media control. Upgrade to the available premium Harman Kardon® ten-speaker sound system with full navigation system and live traffic feature. With your audio controls mounted on the steering wheel, you’ll have entertainment safely at your fingertips. Come appreciate the look, style, and thoughtful design of the new Kia Sorento at Kendall Kia!